Hey everyone, we are back with the Traffic Stats for the month of November. Yes, we did miss out on the Traffic Stats & the Monthly Wrap-up for the month of October primarily due to my sessionals, assignments, etc. The list is long, but you can understand First year of Engineering is not that easy. But still I managed to write 10 posts in November, covering only important topics. You can read them all when I release the Monthly Wrap-up, either today/tomorrow. Though I’m not disappointed that I got to write only 10 posts, because those 10 posts brought in a stable traffic which was more than my expectations. Also wanted to let you all know that, we got approval from Google Adsense. A Big thanks to all for helping when I asked help regarding this matter on your respective Answers forums, facebook & twitter. As I said earlier, the traffic was pretty stable. We received 244 Unique Visitors on 1st of November, which was the highest for the past month. After that there was a decline in traffic which stopped declining at 150 & then stabilized throughout the month. My main Semesters are on for a month, though I will be Scheduling things. Hope everything goes the right way & the traffic remains stable, so that I can cope up after my sems. You can see how Organic traffic continues to dominate our Traffic Stats. It’s all because of unique content & my SEO. About 50% of this months traffic has come from Google. On some days we got 100+ unique visits from organic traffic alone. That itself indicates the importance of SEO in Blogging. Read the below posts to do SEO the right way on your blog/site. 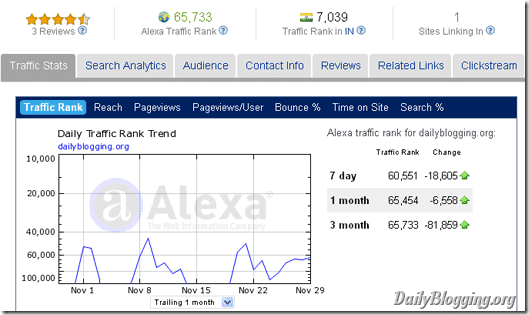 DailyBlogging’s Alexa in the month end of September was around 85K. Now it’s 65K, so progressed by 20K. Though we have a long way to go & I want it to enter 10K by next November. Hoping that we will succeed in doing that. Alexa depends not only on your day to day traffic, but many other factors. 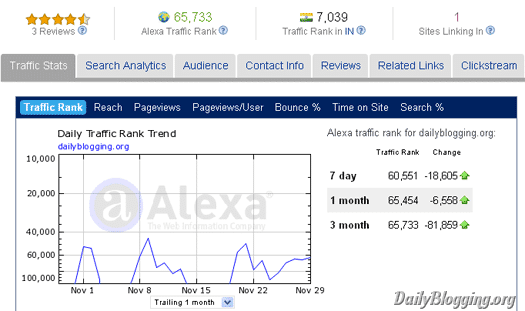 I will write a post about ranking well & the factors associated with Alexa within the next couple of weeks. As I said, that I got approval in Adsense; 100% Revenue Sharing for Guest Authors is in my mind. Also I will be awarding the Top Commentators (top 2) a 125*125 banner link in the sidebar of this blog. Will make the official announcement regarding both the Revenue Sharing & the Top Commentators Award! soon in a Separate post. You can Subscribe to Our Daily Updates / RSS Feeds to get the official announcements on 100% Revenue sharing & the Top Commentators Award! in your Inbox or your feed reader. What do you think about the 100% Adsense Revenue Sharing & the Top Commentators Award! ?? That’s some great stats Mani! Well now your post count is 111..
Hope you reach more glory! Nice, but not impressive, hope you will a good traffic in future. Good to see you are progressing and Google is your friend. Keep doing delivering stuff. bounce rate is too high…. but you have quite good unique visitors…. Nice stats! Hope they keep improving. That’s very healthy stat. Keep the good work on and your traffic will surly double in a few weeks. congrats, way to go brother 🙂 Good luck. GReat Stats. Good to see you moving ahead in terms of traffic and growth. Your Stats are good..still need to look after the Bounce Rate..Congrats for your Adsense Approval..
Nice stats – you’ve got a nice steady amount of traffic flowing throughout the month – I suspect due to the heavy organic traffic you recieve. Keep at it – its a long journey but well worth the effort. 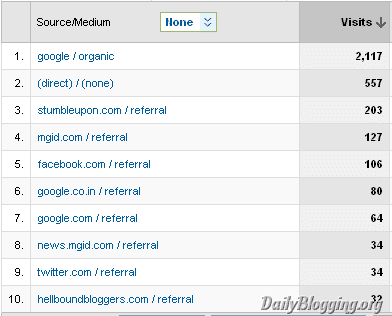 Nice Stats, Hope you will increase visitors in coming days.. I really like the idea of free ad space for the top 2 commenters 🙂 That definitely is a good incentive! And I don’t know if you’d be willing to share them, but I’d be interested in seeing what your top 1 or 2 Google keywords are. Interesting stats. Why was there so much traffic at the start of the month then it dropped 50% and stabilized. You say that your traffic is coming from Google or the Serp’s, are your keywords relevant to your niche, as somebody has already said your bounce rate is well high. That could be down to the adsense though. 4000 uv per month is not bad… you said you got approved in adsense, how it is going ? now a days i see lots of peoples using technoratimedia, how they are going ? wow…so many visitors from google…..great buddy…. great stats mate this type stats will motivate the new bloggers. keep rocking. 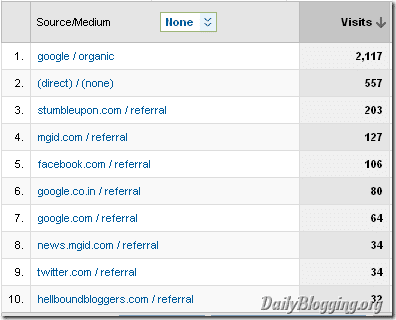 good organic traffic dude..i am striving hard to get organic traffic..can u help me with some tips to improve organic traffic..